Opposition MPs in the LOP’s board room strategising for today’s plenary sitting. Photo by Beatrice Leni. Members of Parliament were this morning treated to a spectacle when security personnel manning the main entrance of Parliament blocked opposition legislators from entering with their red bands. Military and anti-riot police are currently deployed around the perimeter of Parliament, ahead of today’s plenary sitting to be chaired by Speaker Rebecca Kadaga. As early as 8am, some legislators started streaming into Parliament. However, when some legislators carrying red bands attempted to enter Parliament, they were blocked by Parliament’s police officers. 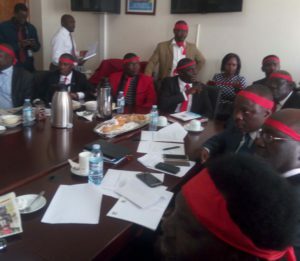 Among them was Kyadondo East MP, Robert Kyagulanyi who arrived at the entrance with a red band tied to his head. Immediately, the police officers blocked him from accessing the parliamentary foyer, prompting an exchange of words. MP .Odonga Otto arriving at Parliament. Photo by Beatrice Leni. “I was told that I could not be allowed to enter Parliament with my dress code. I was shocked to learn that I cannot access the premises. They took my band,” Kyagulanyi told PML Daily in an interview. Also blocked from entering Parliament with red bands was Kilak South MP Gilbert Olanya, who was frisked for close to five minutes. When he tried to resist, two female police officers held and forcibly removed the red bands before allowing him to enter. “They asked me about my red ribbons and told me I couldn’t go in with them. I also questioned them whether my dress code was in contravention of the law,” Olanya said. Other MPs whose red ribbons were taken away are Aswa County MP Reagan Okumu. When the security personnel attempted to frisk Lwemiyaga MP Theodore Ssekikubo, he flatly declined amid loud protests and walked away. 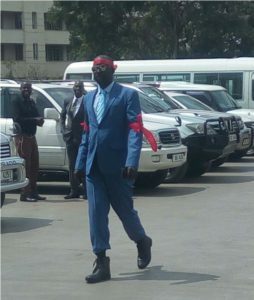 There was drama when Aruu County MP, Odonga Otto walked to Parliament dressed in a navy blue suit and white shirt, plus red bands tied on his forehead and arms. Security personnel created ring around him when he walked through the metal detector. There was a brief alteration between him and the security officers. He swiftly jumped over the security barrier and ran towards the North Wing to the 5th floor, where a meeting convened by the Leader of Opposition Winnie Kiiza was underway. He dashed inside the meeting room to bouts of laughter by the opposition MPs, who were wearing red bands. “We shall take any step necessary to uphold and defend the Constitution using simple means. There is already an intimidation that is happening towards those putting on red ribbons. If they think the ribbon is a weapon of terror, we can choose to dress in red. To us, we believe that is the only way we can communicate our message without taking up arms,” Kiiza told the press. Kassanda South MP, Simeo Nsubuga said there should be more deployment at Parliament to enable a free environment for MPs to debate freely and not be intimidated. In regard to the Order Paper, Raphael Magyezi, the Igara West MP,said he is going to seek for an explanation on why his motion is not included today. “I will request for an explanation on why my mption is not there because I followed the rules on filing my motion within three days of filing notice,” Magyezi said.